Today being a typical cold and grey British summer day, I decided to dress the blues away, arming myself with an array of colours so bright, they would require all passers-by to wear sunglasses – despite the threatening rain. 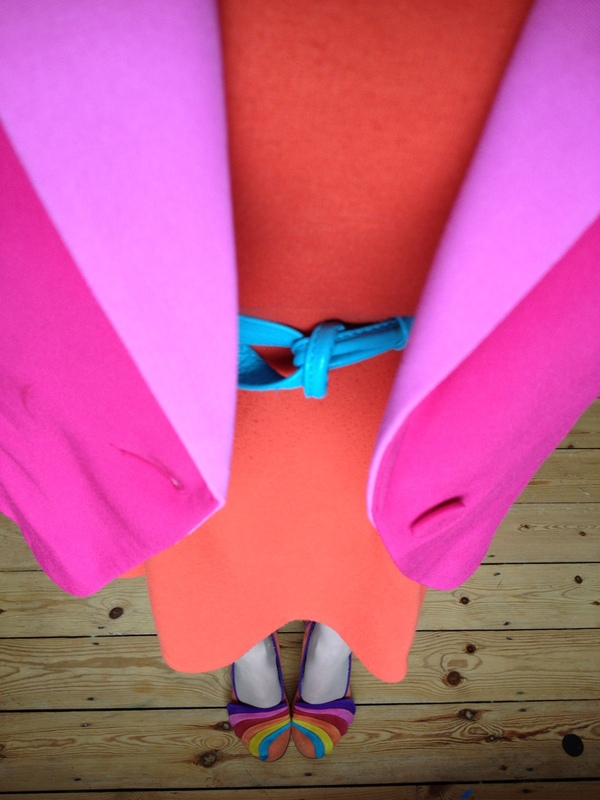 So here I am in my trusted orange Dorothy Perkins skater dress, turquoise twisty Fenchurch belt, posh pink Whistles ‘Wren’ jacket, and orange-multicoloured Irregular Choice ‘Royal Marriage’ heels. Yes, I’ve concluded that there’s nothing quite like dressing to lift your mood. Whether others would agree with my assault on their eyes is another matter entirely! ← Archive: Belt Up Pin-Up!